22 targets total - 10 set aside just for walk ins. Looking for a new and exciting activity to get your adrenaline rushing? Battle Axe San Diego is California’s largest axe throwing facility. Book now and see what the Axe-citements all about! 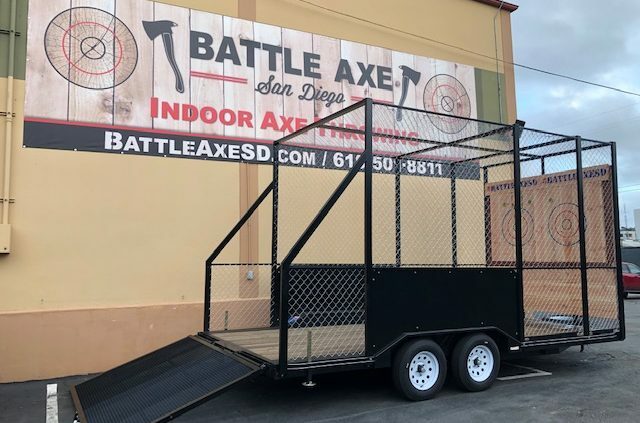 Located in Mission Valley, the heart of San Diego, Battle Axe is one of the first indoor axe throwing facilities in Southern California while also being the largest! Battle Axe San Diego is a family owned business that is introducing a unique, adrenaline packed activity with some style. We have 22 full lanes that dedicate 12 lanes for larger groups like corporate outings, birthdays, and bachelor/bachelorette parties and 10 lanes dedicated for walk ins. We welcome all group sizes, if you only have 2 people in your group, give us a ring. A group of 2 players receive their own lane which is 2 targets. Similar to a game of darts, players throw an axe at the wooden target, scoring points based on where the axe lands on the bullseye. Each game consists of three rounds and each player has five throws per round. The player that wins the most games gets dubbed Battle Axe Champion! We also have tic-tac-toe after you master the craft of axe throwing. If you’ve never thrown an axe, don’t worry – a Battle Axe Axpert will be assigned to your group the entire game. From proper throwing formation, safety procedures, etiquette and even tips to land high yielding scores, your Axpert will guide you from start to finish. Battle Axe is great for all events, whether it’s group activity or individual play, including: small and large groups, league play, and private functions (such as birthdays, bachelor/bachelorette parties, corporate team building and similar other functions).